I’ve made this diagram (which is also on the “About” menu of this blog) in case anyone’s interested. I’ll try to keep it up to date if anything changes. The only addition I’m expecting this year is a fixed VHF radio, probably a Standard Horizon GX2200 because it has built-in GPS and AIS, and so can provide me with a ship proximity alarm without any further equipment. Here’s a slightly out-of-date picture of where the switch panel and most of the connections are located, under the bridge deck. The main difference now is that I have an integrated digital volt/ammeter that is much more responsive. I’ve just written a reply to a thread asking about solar panels on the YBW forums, and I thought it’d be worth reproducing here for anyone interested. 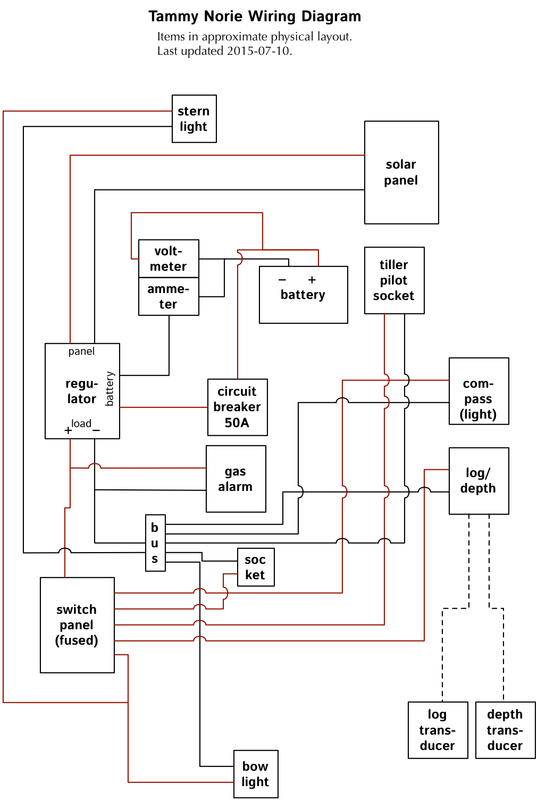 I have a Nasa 20W through a CMP12 solar regulator to my Platinum SD685L 75Ah leisure battery, from which the main drain is the tiller pilot. 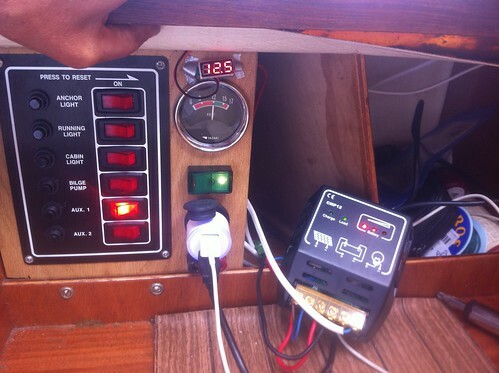 I use the tiller pilot a lot as I’m usually solo, and the panel keeps up with the drain on a sunny day, and generally has no difficulty keeping up with the instruments and lights. My VHF is handheld and charged from the main battery occasionally. I haven’t hooked up a sensitive ammeter and done the calculations yet. However, I do have one of these volt/ammeters with the ammeter in line with the battery and can highly recommend it. (I know then the solar panel is keeping up because the ammeter reads zero drain.) I filled the back of the meter with silicone electronic potting compound to keep the electronics from getting damp. 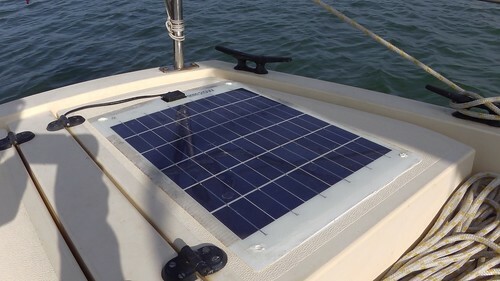 The solar panel was held down by duct tape on the aft locker for a lot of last year, but now it’s stuck down with a generous bead of Sikaflex. Nasa recommend this as a method. It suits me as it’s removable and doesn’t involve making holes in the boat, and especially not putting screws in the deck core, which you should never do. Here’s a picture of the solar panel in its new position. This spot is almost never in shadow. I just have to trim those Sikaflex blobs and clean off the old duct tape glue. The wiring isn’t final either. I’ve looked at a few deck glands but there’s a fairly large connector on the other end of the wire, and I’d like to avoid cutting it off or making a hole in the boat. The wire actually squeezes nicely down the hinge side of the locker, so I might just fix it down (more Sikaflex) more or less where you see it, reinforce where it might chafe in the hinge, and then use some self-adhesive cable fixings inside to connect it forward.